It’s important to remember that your school is driven by your students. And while big classes don’t automatically equate to big bucks for your school, having lots of students is definitely a step in the right direction. Let’s generalize how your school functions. We have Input and Output. Input is all of the success your school gets and maintains. This is the money you make and students you get. Output is all of the success your school loses, what you are missing out on. This would represent the students who leave and the money used up. Obviously, we want to maximize our input and minimize our output. While there’s a plethora of variables that can affect both of those numbers, one of the big things that impacts them both is the instructors teaching the class. What the instructors do on the mat is a huge part of how successful a school becomes. Would you use a bank if its employees said they might keep your money safe? How about using a parachute that says it might open? I don’t know about you, but I might soil my pants if I had to use them! If you want to be successful and grow, you have to be good at what you do and communicate your professionalism well. If you want your martial arts school to give as many positive experiences as possible, everybody needs to be able to perform their role well. Good classes and personalities on the mat improve student retention and local interest in the school. People will not only stay in your classes, they’ll also start to tell their friends and family members how great your classes are. The power of word-of-mouth advertisement is staggering and, for better or worse, people will talk! Here’s what you and your instructors can do to give the best experience to everybody who walks in the door. CORRECTIVE FEEDBACK! WHAT COUPLE’S THERAPY CAN TEACH US ABOUT TEACHING! Let’s start with corrective feedback. Like that delicious whipped topping on apple pie, feedback is a powerful detail that is often overlooked. To say there is a lot of depth to this concept is a gross understatement. PCP is initialism for “Praise, Correct, Praise.” This is key to making a correction and keeping it positive, avoiding what is called a Perceived Indifference. Did you have a teacher in academic school who you would swear hated your guts, bones and every fiber of your being? While it’s possible you just had a bad teacher who really couldn’t stand you, a lot of the time it is simply a misunderstanding. They cared about you, but their feeling didn’t get communicated very clearly. This is a “Perceived Indifference.” While not legitimate, it may seem all too real to a student. There’s a reason that couple’s therapy often stresses communication with one’s significant other. Without clear communication, it is easy to assume the other person doesn’t care about you. If we only bark out what a student is doing wrong or don’t communicate very clearly, we can’t really blame him/her for thinking we don’t care about them. Imagine that a student - let’s call him “Johnny” - has a problem with keeping his hands up while kicking. Rather than simply calling Johnny out and saying “Hands up!” find something he is already doing well. Maybe his hands are like deadweights, but his kick itself has really impressive aim. That’s something we can focus on and praise. Afterwards, we can remind him to keep his hands up. From there, two things can happen. Either the problem gets fixed (Johnny’s hands stay where they need to) or not (his hands still keep dropping). If he improves, excellent! We can give him a high five, a toothy grin or some other form of praise. If he is still having trouble keeping his hands up, we can keep giving him feedback, looking for small improvements towards the goal and building from there. All of that praise isn’t just to make him feel good, though. It also helps cement what he is already doing well. How horrible would it be to have Johnny get his hands up, but then lose that phenomenal precision he had earlier? It would be like when you run into somebody walking the opposite direction and you try to step out of their way only to run into them again and again. It can easily become a revolving door of problems. We want to build up his progress, not just swap out what the problem is. Find the good in what your students do, no matter how awful what they are doing incorrectly may seem at first. Even your worst-behaving three-year-old will do at least one thing worth praising during his/her first lesson. It doesn’t have to be speed or strength that we praise, however. It can be focus, self-discipline, awareness, confidence, effort, patience, or numerous other positive attributes. Let them know about whatever positive thing they are doing that you want them to keep doing before you make a correction. 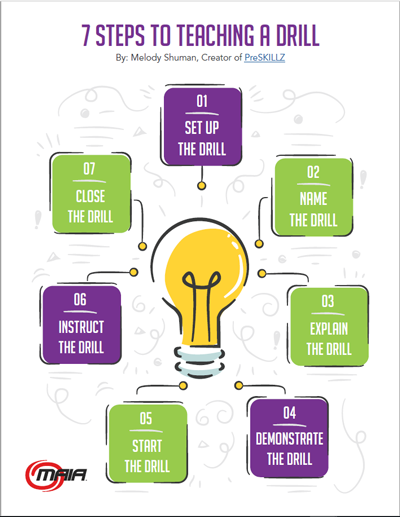 This is a great tool to use if you need to talk to a parent about a student’s misbehavior on the mat after a class finishes up. No parent wants to think his/her child is bad at an activity. The moment that martial arts doesn’t seem to be a good fit for the child, becoming a dropout becomes a lot easier. Let them know what the problem was and how to go about fixing it. (“I didn’t see the kind of focus I usually do from you today. Maybe today was a rough day for you. Everybody has those. Even on your worst days, we want to see your best, though. Eyes focusing on me, listening and standing like a black belt”). The idea of PCP is only one type of feedback, however. Let’s look at how we can use another kind of feedback to dramatically improve the entire class’s performance in just a few seconds. OF SPOTLIGHTING AND MASS MIND CONTROL! Let’s learn a Jedi mind trick. tool when you’re teaching on the mat and most of the students are lackluster in their performance. constant activity everybody is doing while school is out, most of the students are noticeably tired. Rather than being the barking PE teacher everybody hated in middle school, you can find the student who is giving his best and spotlight him. Give him public praise. Pull him to the front and have him demonstrate that amazingly sharp front kick. Make a big deal about how focused he was while standing in his resting position. Do something to let him know how impressed you are with him. By calling out whoever is doing really good, everybody else is now thinking about what they need to do to get that praise. gives them a goal and an example of how they should perform. to step up their performance, but rather just one student. Simply comment on how well the student beside him is doing and he will almost always improve his performance to match. comment on how well they are doing or how much better they suddenly got and extend that praise to them. Praise can be a very powerful thing. The important thing is to be fully honest and exact about it, though. Simply saying “Good job!” or “Nice kick!” is generic and could apply to anybody. It doesn’t really feel genuine, even if it was said directly to your face. What were they doing a good job at? What was nice about their kick? However, sometimes the one who needs to overhear the praise the most is out in the lobby watching class. If somebody showed really good improvement or performed extremely well, let his/her family know. We can get so focused on fixing every mistake a student makes that we forget to give a student an idea of what they are doing well. Let me tell you a secret, though. Are you ready? Everybody makes mistakes. Even you. to improve. Our job as teachers isn’t only to correct and improve a student’s skills, but also to ground them in how well they are doing. foundation for how well they are doing. Praise is extremely important, especially for beginners and their families. When you finish up a class, pick someone and go talk to their family. feedback on their progress, on what they improved at. If you can’t find the time to do it after class, be sure to call them later or send a handwritten note. These small acts carry a lot of weight. In fact, like our next subject, sometimes it’s the smallest things that have the biggest impact. UPGRADE YOUR TEACHING TO MOM-LEVEL WITH “MAT VISION” AND MOVEMENT! happening on the mat and in your school at all times. Do you remember when you were a kid and you’d try to sneak something behind your mom’s back to do something? She didn’t even have to turn around to know what you were doing. All you wanted was to grab a cookie from the kitchen before dinner. But she would call out what you were trying to do before you could even complete your ninja trick. That’s the seemingly supernatural level of awareness we want. We want to be “Mom Level.” Mirrors can help a great deal in being able to see everybody at all times. That gives you the option of simply glancing in the mirror to make sure every person in class is still following you. However, mirrors have a disadvantage if used too heavily; your awareness doesn’t get communicated very well. As important as it is to see what’s happening, it’s also important to let everybody know you are watching, all the more so in children’s classes with parents present. If you only keep your eyes glued on the mirrors, never glancing over your shoulder at the actual class, it’s easy for them to feel like you are missing out on some stuff that is happening on the mat, or even that you don’t care about the class. Like praise, your awareness needs to be communicated well. Avoid letting your back turn to the class too frequently, especially if you don’t have many assistants for the class. Make it your goal to land eye contact with every student in the class at least as often as you say their name (see sidebar story, “State Your Student’s Name at Least Three Times!”). One of the things this goal will force you to do is actually face the class and walk around. If you stay in one spot, it’s not only extremely difficult to make eye contact with over 30 students in one class, it gets quite boring for the students. It becomes akin to learning from a talking statue. That’s not very motivating. Move around and connect with as many people on the floor as possible, spreading your awareness like middle school selfies. Your movement can set the pace of the class. If everybody needs to slow down and work on proper technique, you can walk around a bit slower, stepping as deliberately as the students’ movements should be. If you want them to be quicker, hasten your steps, not quite to the extent that you look like an expresso addict, but just enough that there is a nonverbal cue to pick up the energy. STATE A STUDENT’S NAME AT LEAST THREE TIMES! noticed. And while not everybody wants to be rock-star famous, everybody wants to be recognized to some degree. Think of how it would feel to be completely invisible and ignored, by no choice of your own. How it would be to feel like you didn’t belong? For most people, the answer is that it would not be fun. One of the things we can do as teachers is actually learn and care about our students. Yes, it’s good to get to know what they like and dislike, where they go to school/work, and what other activities they do, etc. But sometimes, it’s the small things like saying their name that matters most. That is something that gets missed all too often in class, especially in a large classroom setting. If you find yourself addressing students only by belt color or experience level or plainly “Hey you!” (and the numerous variations of that generic greeting), you’re basically telling those students that you don’t want to bother even remembering their name. Simply saying students’ names at least three times during their class session can mean a lot. It has the effect of building rapport by letting them know how much you care about them and helps foster a feeling of belonging. But don’t stop there! Strive to know the names of their siblings, parents, children, or even their best friend. Referencing anybody else who is a part of their life, especially if they are often at the martial arts school with them, helps establish that familial feeling even further. While that might seem like a lot of names to remember, I promise it is easier than it seems. There is one little trick to it. It’s called listening. Students, especially younger ones, often talk a lot. Communication builds rapport and it is a two-way street. We have moments before and after a class where we can talk to students. But more importantly, we can use that time to honestly listen to them. Even if it’s a six-year-old telling you a story longer than an epic poem by Homer, be genuinely interested in it. That honesty and listening ear will go far and be appreciated. It’s easier to stick with a martial arts school if they feel like family. And family means nobody gets left behind. with that and, if you use it along with “Name 3x,” will truly upgrade the rapport you have with your students. THE PERFECT PLAN AND HOW TO EXECUTE IT! Have you ever seen a professional chef prepare food in front of you? They have very few wasted movements. Like a martial artist avoiding telegraphing, they know that even small wasted movements can add up to a big loss. What carries significance isn’t always what you add to the class, but rather what you take away from it. When teaching a class, you want to be efficient and avoid wasting any amount of time. So, let’s do some martial arts math. A class that is 45 minutes long could have a 10-minute warm up and stretching routine. Add in five minutes at the end of class to wrap up with announcements and a game for kids classes, or rituals/routines of respect. You are left with only 30 minutes of actual class time. That’s really not a lot of time spent working on improving curriculum. Every. Second. Counts! Downtime is the time spent not training or improving. This is the time spent excessively describing a drill. Even just stating filler words (common culprits: uh, um, so, okay, alright) too frequently can result in downtime. In fact, that can become quite annoying. Having a plan and being confident in it can help. You must be confident enough to deviate, though. It’s easy to become so fixated on your plan that, when you need to adjust something, you freeze. Your brain feels like it short-circuits and your plan becomes useless. A general plan with clear goals is better and more malleable than a super-detailed, step-by-step process plan. It’s easier to give the class a big-picture idea of why they are doing whatever they’re doing when you have a more goal-oriented plan as well. This is something the adults especially love. They appreciate the “why” behind a drill as well as the “what” on how to do it. Once you have the goal for the class segment, it’s a lot simpler to decide on what drills to do and how you want to set things up. Students come to class to get better and to have fun and having a goal helps with both. They know what they are working towards and can have more fun because of it. Like beating the speed-run high score on a Super Mario video game, it becomes a challenge. The students enjoy it more and leave class feeling accomplished and inspired to come back again as soon as possible to meet another challenge. They should leave your school better than they entered. Ultimately, that should be our long-term goal with them as well: To take a random stranger, young or old, and to help them discover the best version of themselves, no matter how long it takes. 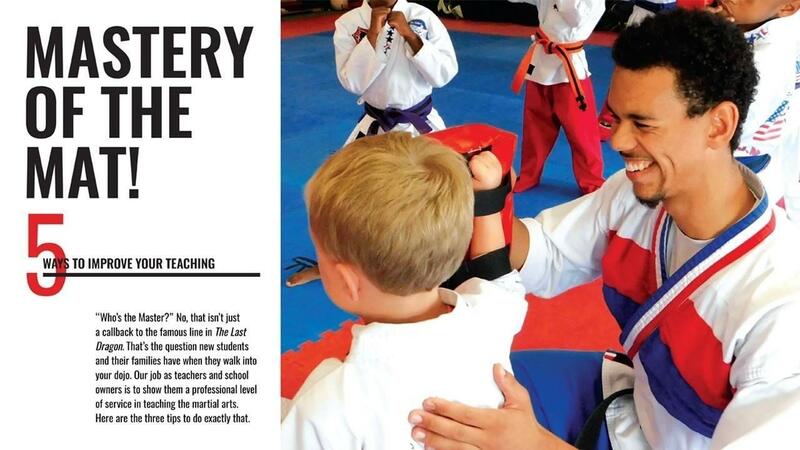 To help build them into the best martial artists they can become. Isn’t our job the best? You have to enjoy what a blessing it is to be a teacher! Students are like a mirror and an echo. They often reflect what you give them, visually and verbally. Your words and actions set the tone for the class, beginning to end. All the more reason we need to give our absolute best every time we are teaching, both in planning and leading the class.